Radio City 2’s Claire Simmo, who stars as the Fairy, hosted the event – and was on hand to introduce her fellow cast members. 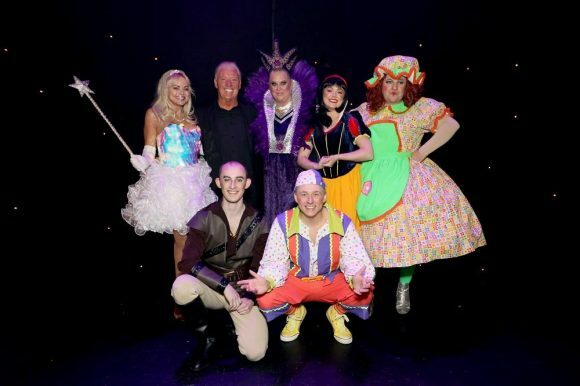 Leading the all-star cast is The Queen of Clean, Kim Woodburn as the Wicked Queen. Television presenter and expert cleaner, Kim Woodburn is best known for presenting Channel 4 show How Clean Is Your House? from 2003-2009. The television personality has also remained a household name with appearances on the ninth series of I’m A Celebrity…Get Me Out Of Here! finishing runner up in 2009, and entered the Celebrity Big Brother house as a housemate on the nineteenth series in 2017, where she made it to the final and finished in third place. Britain’s best loved and most entertaining medium, Derek Acorah, will be using his psychic ability to declare who is the fairest of them all as he appears as the Magic Mirror via the power of video projection. The Liverpool born star is most notable for his work on British paranormal reality television series Most Haunted from 2002-2005. He has since starred in numerous tv shows including Derek Acorah’s Quest For Guy Fawkes and Derek Acorah’s Ghost Towns. He also competed in the twentieth series of Celebrity Big Brother in 2017, finishing in fourth place. Britain’s Got Talent star Lewis Pryor storms back on the Epstein stage after taking audiences on a high flying adventure to Neverland last Christmas as Peter Pan, who returns as Muddles. The young star finished 3rd place during the live finals of the 2016 series of the ITV show with dance troupe Boogie Storm. Michael Chapman never fails to have audiences rolling in the aisles laughing, and he is certain to keep everyone on their toes with his hilarious comedy antics as he makes a welcome return as Liverpool’s favourite Dame. New cast additions include Mia Molloy who returns to play Snow White after dazzling as Jill in Easter’s Jack and the Beanstalk, and Liverpool actor Alex Patmore, who is currently playing Bobby in the UK tour of Cilla The Musical, will play Prince Charming. After fleeing the Kingdom to escape the Wicked Queen’s evil plans Snow White seeks refuge with seven dwarfs living in the forest. Complete with wonderful songs and choreography as well as poisoned apples, magic mirrors and of course that much loved panto magic, Snow White will have audiences on the edge of their seat. Limited number of £11 tickets available on all performances from Fri 7 Dec to Mon 10 December. Tickets can be booked online with The Epstein Theatre or through Ticket Quarter.